Last week, for the umpteenth time, Americans were called to the altar of reason after a study revealed that it now costs the U.S. Mint 1.6 cents to produce a penny. This was actually good news — last year the penny cost 1.8 cents to produce because of the high price of zinc — but it was yet another call to arms for those hoping to rid the United States of its tiny copper burden. Would an annual reminder about the waste of tens of millions of dollars invigorate the nation to become pennywise? For reasons that seem to dwell in the same emotional vein as the protests against the downgrading of Pluto just eight short years ago — all previous attempts to abolish the penny, including measures in Congress, have failed. It's more than just nostalgia at play, but a very real old school defiance. For an example of how America can rid itself of its copper-colored friend, The Wire reached out to Dr. John W. Galbraith, who chairs the Economics Department at McGill University in Montreal. 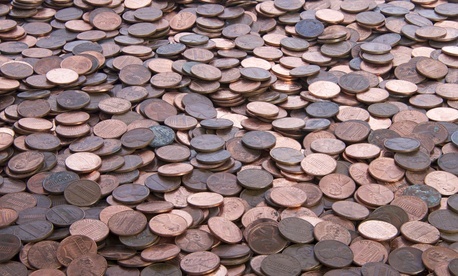 Galbraith's home country stopped producing pennies altogether in 2012. First, we asked if it's fair to compare the value of the Canadian penny and the American penny. The answer is yes: "In both Canada and the United States, ten cents is now worth what the penny was worth in 1950." The economist's subtext here is that inflation has made the need for pennies in both countries completely obsolete. Galbraith added that "anything less than the dime" isn't worth keeping around either. As he expressed his wishes to see the Canadian nickel also meet its doom, we immediately pictured partisans from the pro-Jefferson and pro-buffalo camps amassing in a basement somewhere outside of Charlottesville, plotting and sharpening their bayonets with nickels. He told us that knocking both the penny and the nickel out at the same time would be better, not only because it will eventually be necessary to do both, but also because America would get to one-up Canada along the way. Galbraith says that while Canada successfully weened itself off of its one-cent piece, the penny, "is still the unit of account in Canada" and the transition "has the air of not being finished." Because of this, Galbraith calls Canada's ditching of the penny "an inelegant solution," but he also characterized the transition as pretty seamless. There were signs in stores that read "we no longer require pennies" and within a few months the new system was generally understood by everyone. The reasoning was understood as well: In addition to the costs to government and the environmental toll, the abandonment of the penny aided a country already burdened by "heavy pockets full of change." Poor Canada already uses both one-dollar coins (the loonie) and two-dollar coins (the toonie). While Americans may not have that specific problem, we asked Galbraith about the nostalgia element — specifically the idea that Americans might be more attached to their Lincoln pennies than Canadians were to theirs. He conceded that the Canadian penny was a little bit easier to extinguish. The Canadian penny has the Queen on it and a maple leaf. The Queen is on everything and there are lots of maple leafs around so there was little backlash." Dr. Jeff Gore is a professor in MIT's Physics Department, as well as the founder of the advocacy group RetireThePenny.org . Throughout the past dozen or so years, he has served as the face on the obverse side of the anti-coin movement. The genesis of Gore's opposition has less to do with the value of the coin, its production cost, or its environmental impact than the simple truth that having a bunch of pennies in our daily transactions really holds things up. What is most important to me is very much the waste of time. I think the value of our time spent handling pennies dwarfs these other costs." Gore told us about a study he conducted years ago in which he used data from Walgreen's to determine that Americans were individually losing four hours per year (or, by his estimation, $15 billion collectively) in its dealings with pennies. When we mentioned the Canadian model, he approved, saying that most already round currency to the nearest penny. But he was cool to the idea of ditching the nickel. There is one complication associated with retiring the nickel, which is that we're left with simply the dime and the quarter. That's problematic because if we're rounding to the nearest ten cents and you buy something for say seventy cents and you give them three quarters then you can't actually get any change back. It leads to some weirdness." He added that most countries with a ten-cent piece as the small coin often have a twenty-cent piece and a fifty-cent piece as well. "Retiring the penny is a very explicit acknowledgement of the fact that there has been inflation over the years. And it's not that it's been hyperinflation necessarily, but three percent each year for many years. For many people this is painful to acknowledge, this idea that our currency is being less valuable." He added that reforming the system is acknowledging that something many people don't like has taken place. While places like Canada, Israel, and Australia have scrapped the penny altogether, in other places there is a simple denial that the penny exists at all. In the Netherlands, for example, they still have penny coins, but simply don't use them. More surprisingly, Gore told us that American military bases also don't use pennies. "Our military has continued to function okay," he told us. "And any problems that have arisen haven't been caused by a penny shortage."